Weeks later, as I picked up forgotten snapshots of my travels at the local Kodak shop, the Wang’s smiling faces moved me to a point that radically changed my life: memories of them immediately strongly inspired me to move to Shanghai. I was driven to probe this “crazy city” hovering at the fringes of antiquity and extreme modernity, to “slough off its skin” like a molting snake before it was too late. This “in-between” stage was mesmerizing…. The Wang family had been the inspiration. I had to be faithful to the promise I made seven months previously. The day after my move to China I rushed out to look for the Wangs and give them our group picture taken on their doorstep. From that day on we met often and a deep friendship began! There was a sense of mutual trust. So instead of staying in the loneliness of my art-deco hotel, I preferred to write at the Wangs - in the family kitchen that was also Mr. Wang’s workshop (a tailor) and my new tiny Chinese office that he kindly shared with me. Their modest home – a mere few square meters, and even more: their humanity and warmth, quickly become my “refuge”, my “den” for launching documentaries exploring some of China’s social issues such as the one child policy, trans-sexuality, prisons and the death penalty. Creative schemes were hatched at their small wooden Mahjong table. The Wangs energized me and inspired creativity within me to work on difficult or taboo stories. Until that fateful day… when the Wangs told me their house was to be demolished. Erased forever from the Shanghai City map! Grieved at their fate, and moved by their resigned response to their loss, I decided to buy a camera, and film “everything” until the end. At that time - a few months before the tragedy of 9/11 that would also touch the Wangs life, I was angry with the Chinese Authorities, who obviously were in a hurry to eradicate their past with impunity! I was under the misconception that the Wangs shared my inner revolt. It took almost two years to understand how my western assumptions had blinded me to the truth... the Wang’s truth, which they expressed in front of my camera. There was no nostalgia ... just deep hatred of the old house, its stench of ages, the grime, the complete lack of privacy and dignity. 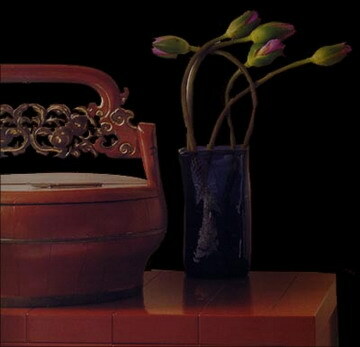 In other words, my film had begun with a colossal misunderstanding nourished by a very personal and innocent dream to immortalize the three generations of Wangs and their traditional way of life that stretched back for several centuries - to before the Opium Wars, before the Foreign Concessions. My quixotic illusory desire was to save some parts of this ancient world, this old existence: precious and romantic to my own eyes as to the eyes of naive outsiders; abhorred in fact by the Wang family and by millions of other Chinese who have had to endure this grubby living for multiple generations. “Shanghai Waiting for Paradise” has been a unique opportunity to try to unravel the Chinese psyche over a period of half a decade – from a vantage point of just a few square meters.